Former NFL star Mike McCoy made an impact on the football field – and, he hopes, in Erie’s Catholic schools. The Erie native and Cathedral Preparatory School graduate this week brought a message of faith, hope and encouragement to the six schools that make up the Erie Catholic School System. 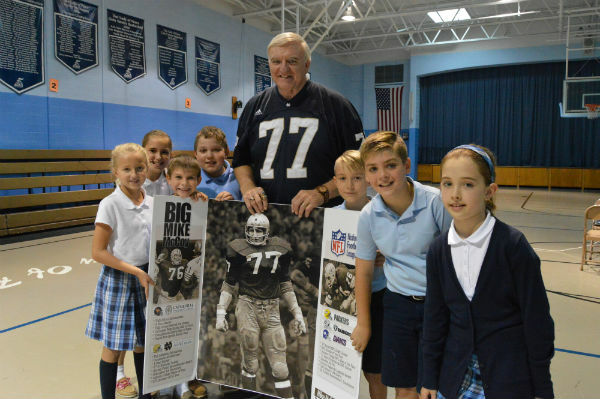 McCoy, now on his final speaking tour with Mike McCoy Ministries, regularly visits Catholic schools to talk about what it means to be a champion and a friend. “But when they do have friends, they don’t always follow the definition because they want to be liked and accepted,” he said before speaking with third-, fourth- and fifth-grade students at Our Lady of Peace School. Faith, hope and encouragement enable students to make better decisions throughout their lives. At Our Lady of Peace, McCoy spoke with students, shared a brief highlight film of his career, answered questions, and spent a few minutes talking with Hunter Krahe, a fifth-grader who injured his leg playing football. McCoy signed his cast. McCoy played 11 years in the NFL – seven with the Green Bay Packers, two with the Oakland Raiders, and two with the New York Giants – and won several awards, including the Bronco Nagurski Legends award recognizing the best defensive football players in the last 40 years. He is a member of the Erie, PA Pro Football Hall of Fame, the Cathedral Prep Hall of Fame and the Pennsylvania Sports Hall of Fame.